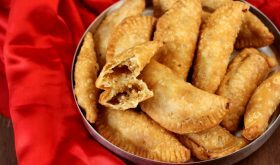 Today I have for you Gujiya recipe which is a Holi special sweet like Malpua, Thandai and the likes. It is made in most parts of India and goes by different names like Ghugra, Karanji (Maharashtra), Pedakiya (Bihar) and Nevries (Goa). 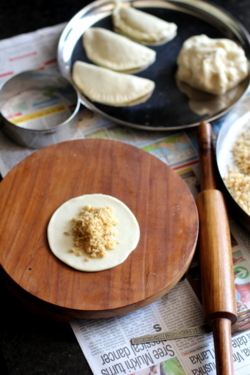 Gujiya is what we Andhras call Kajikayalu, the recipe of which I have blogged earlier. Both Gujiya and Kajikayalu follow the same recipe and procedure. The filling for Gujiya and Kajikayalu is a mixture of roasted dry coconut, nuts, khoya or sooji (semolina), cardamom powder and powdered sugar. Gujiya is not an overly sweet dish. It has a crispy, flaky exterior with a cardamom flavored sweet filling. Today, am blogging Mawa Gujiya where unsweetened khoya is used in place of sooji (semolina). It can be stored at room temperature upto two weeks. 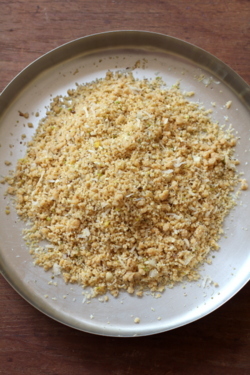 In a bowl, add the flour, salt and ghee and rub with your palm and fingers such that the dough appears like bread crumbs. Add jut enough water to make a pliable yet FIRM dough. Divide the dough and shape into small balls. Keep aside covered for half an hour. Meanwhile, heat a pan, add 1/2 tbsps ghee, add the grated coconut and roast over medium flame for a few minutes, approx 5 mts till it turns golden brown. Remove and keep aside. If using fresh coconut, roast the coconut till there is no moisture. Ensure that its well roasted, it takes longer time to roast than dry coconut. In the same pan, add a tbsp ghee, add the nuts and roast till golden. Remove and cool. Once cool, make a coarse powder and set aside. In the same pan, drizzle 1/2 tbsp of ghee and add the khoya/mawa and roast for 5-6 mts. Remove, keep aside to cool. 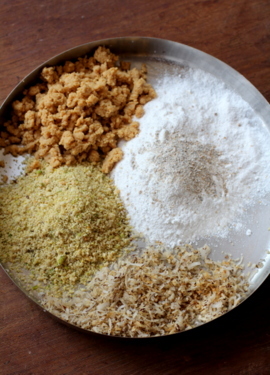 Powder the sugar and mix with the roasted dry coconut, ground nuts and mawa. Add the cardamom powder and mix well. Set aside the prepared filling. Now, roll each ball with the rolling pin into a thin puri of approx 31//2" to 4" in diameter. Spread a tablespoon of the filling on one half of the rolled out dough. Wet your finger and run it along the edges of the spread out dough with water and fold over to the opposite end, enclosing the stuffing to form a semi-circle shaped gujiya. Press the ends firmly so that the filling doesnt come out during the deep frying process and use a fork to seal the edges. Alternately you can twist the edges around the gujiya. Heat enough oil in a wide vessel to deep fry the stuffed kajjikayalu. Slowly drop 3-4 gujiyas into the oil and deep fry them on medium flame till golden brown. Turn them carefully to cook the other side as well. Drain the gujiya with a slotted ladle and remove to a plate. Cool and store in air tight containers. Gujiya remain fresh for atleast a week and can be stored utp 2-3 weeks. For a sweeter flavor, you can immerse the deep fried gujiya in sugar syrup for a minute and drain. Garnish the gujias with almond slivers and pistachios while they are warm and moist with the sugar syrup. Once the gujiyas dry, they can stored in an airtight container upto 3 weeks. Make the gujiya in batches. Roll out, stuff and deep fry 3-4 gujiyas at a time (batch-wise). While preparing the next batch of gujiya, reduce the stove flame and carry out the process. When deep frying the next batch, see that the oil is hot enough to deep fry. Keep the dough covered through out the preparation process. Sugar can be replaced with powdered jaggery. 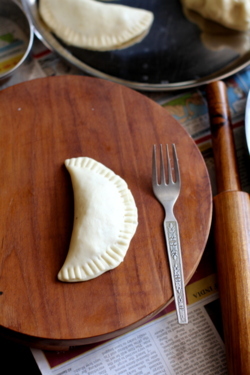 Gujiya moulds are available in the market and can be used to shape the gujiya after rolling out the puri. 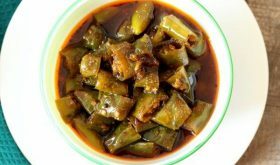 One of the variations for the filling is it to use khus-khus or poppy seeds in place of sooji, roast 4 to 5 tbsps of khus khus and use. Another variation is to use powdered dalia aka putnala pappu (roasted chick peas) in place of sooji along with dry coconut and sugar. If you do not have dry coconut on hand, you can use roasted and powdered sesame seeds. By Sailu Published: March 16, 2014 Gujiya recipe, a classic Indian sweet among Holi special dishes. 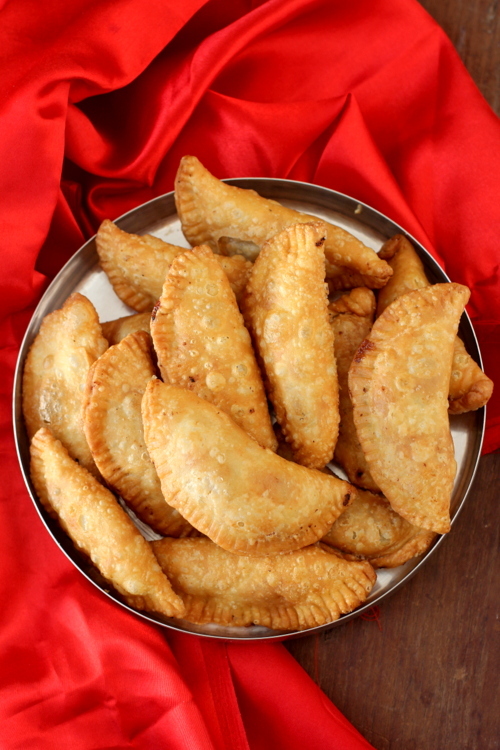 Learn how to make Mawa Gujiya that has a filling of mawa, coconut, nuts, sugar & cardamom. Recipes are so simple but looks unique..I like the way you are presenting step-by-step process..makes easy for starters who r learning ..Thanks again for your wonderful recipes..
idi definite ga try cheyalsina recipe:) pictures are very helpful. There is no need to use baking soda. If using, add a small pinch.